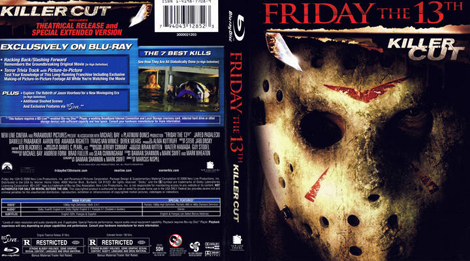 Home / Home Video News / The Films: 2009 / Friday the 13th 2009 Blu-Ray Delayed? Friday the 13th 2009 Blu-Ray Delayed? A few months ago we brought you the first news on a new Blu-Ray release for Friday the 13th 2009. In essence, the new Blu-Ray was to be a re-release of the newest Jason Voorhees venture in which only a single disc was to be included. This sparked some interest and controversy on what would be included for sale. For starters, with only one disc being included, questions were brought up as to if there would be a digital copy included as with the original release? Also, some confusion on the aspect ratio cause quite a stir on certain websites and forums. Finally, fans wondered if there would be new extras for the film, and that was never really clarified by Warner Bros.
Well, the release date for the new single disc release of Friday the 13th 2009 was supposed to be August 16th, and that date has come and gone. The interesting thing is that the Friday the 13th 2009 re-release was nowhere to be found, in stores or online. Amazon now has the film listed as Currently unavailable and Best Buy's online listing has the Blu-Ray listed as Not available in stores and Back-ordered for online sales. Perhaps there were some issues with the discs themselves that caused a delay in release, or maybe one or more of the issues mentioned above cause Warner Bros. to hault release until they were resolved. We will let everyone know more when information becomes available.